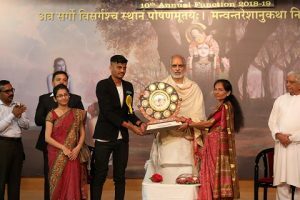 Gurukul celebrated its 10th Annual day function in the auspicious presence of Pujya Bhaishri on 12th and 13th January 2019 for English Medium and Gujarati Medium respectively. The functions were held at the Sandipani Auditorium in the presence of the Chief Guest for the day Dr.Partharajsinh Gohil IPS, District Superintendent of Police of Porbandar and the Guest of honour was Shri K.V.Miyani, District Education Officer of Porbandar. Due to official commitments Shri K.V.Miyani could not attend the function. The day’s proceedings started with a beautiful prayer recited by the students of Gurukul, followed by lighting of the lamp by Pujya Bhaishree and the dignitaries. 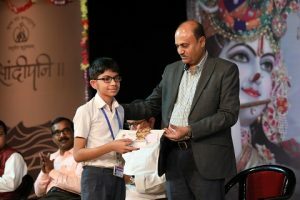 This was followed by the formal function which commenced with the Principal’s report and then the distribution of prizes for academic excellence for the Gurukul English Medium students. The prizes were sponsored by Shri Pramod Taparia and family from Mumbai. Dr.Partharajsinh Gohel addressed the audience and emphasised the need for hard work as well as the thoughtful choice of career to succeed in life. 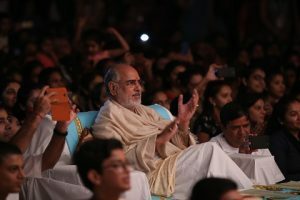 Pujya Bhaishri, in his address to the audience, described the four pillars of education and stressed upon the role of parents and teachers in educating the modern generation. Watch Pujya Bhaishri’s speech in this video. Thereafter a cultural programme was held which was prepared by the students within a short period of two weeks under the supervision and guidance of teachers. 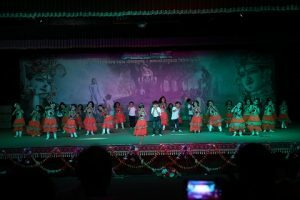 357 students from Junior KG (age 3 years) to class 12 presented different forms of dances, drama and Yoga. 27 students anchored the programme and took the audience through the programme. 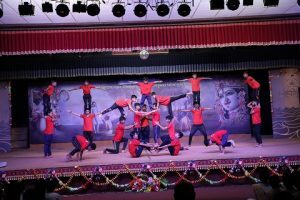 The audience was spell bound to see ‘Maniyaro dance’ by the boys, which is a well known dance form in Saurashtra and performed across the world on different occasions. Execution of Yoga with surgical precision by the Hostel boys was well appreciated. The Chief Guest on the second day was Shri M.A Pandya IAS, District Collector of Porbandar and the guest of honour was Shri J.C.Kothiya GPS, Deputy Superintendent of police of Porbandar. Due to some unforeseen emergency, Shri J.C.Kothiya could not attend the function. We were fortunate to have had Mrs.Nilambariben Dave, Vice Chancellor of Saurashtra University, as a guest of honour for the day. The day’s proceedings started with a beautiful prayer recited by the students of Gurukul, followed by lighting of the lamp by Pujya Bhaishri and the dignitaries. 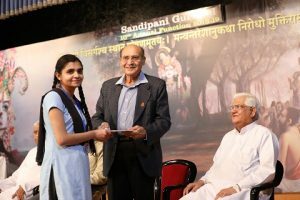 The formal function started with the Principal’s report, followed by the distribution of prizes for academic excellence. The Shobhachand Taparia prizes for Academic Excellence were sponsored by Shri Pramod Taparia and Family from Mumbai. Shri M.A.Pandya addressed the audience and emphasised the need for imbibing cleanliness in our life. 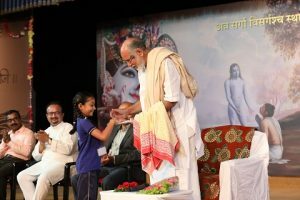 Pujya Bhaishri, in his address expressed that, primary education in one’s own mother tongue is easier for the child. At the same time, English must be taught as a language as it is inevitable in the present global village. 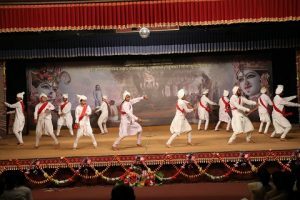 The celebrations ended with a cultural programme including dance, music and drama in which 285 students performed on stage. 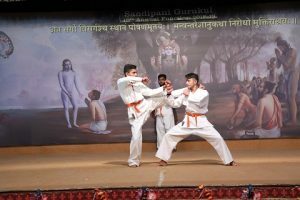 Self-defence techniques shown by the students through a display of Karate kept the audience spellbound.